Discussion in 'Gameplay Discussions' started by Yiffed-Foxy, Jan 18, 2019. Sorry, i'm a not native speaker of English and i am not good at writing :c Just want to ask what about other races? The game is contented only human race or we will see something new? And what about Project EXA? The game is contented only human race or we will see something new? Short answer: The game only have playable human race and this is because of the story and lore. There are 2 factions that you have to choose from; Ontari and Vulpin. Lore/story of the game: There was a world called "Harth" that is occupied by 3 human kingdoms; Ontari, Vulpin, and Nous. The Ontaris and the Vulpins were once immortals and were warring against each other, while Nous developed their flying technology after the discovery of levitating stone. The Nous built an airship-fortress called "Embyon" that saved them from the destruction of the world while the Ontaris and Vulpins perished from the surface of Harth (and not even their immortality were able to save them). The world was shattered by rain of meteors, dividing the world into many segmented floating continents. The Embyon (the people of Nous) took haven on a floating island above Harth and named it the continent of "Nousgard". It is from there that they chose to revive the Vulpins and the Ontaris so they can use them to help rebuild the kingdom but erased their memories due to their past aggression against each other. The Vulpins and the Ontaris were reborned from their souls lingering in the now-continent of Harth to stage of infancy as "children of stars". Short answer: Nobody in the public knows. Some infos: Project W, since 2012, and Project EXA, since 2014, were in development from early concepts. Project W or Project World is this game called Ascent: Infinite Realm. Bluehole already stated that Project EXA and Project W will not be a sequel/prequel to TERA (it will not be a TERA game), but will be adopting/sharing similar graphical/art-designs to TERA, that's it. That 3D Character Render of an Elin from Project EXA that were uploaded on 2015 is one of an example of design resemblance to TERA as the Devs confirmed. Can you at least give your character elf ears in creation? I never really noticed if there was a slider for that. yesterday I posted on the new information thai version discord/general room. female and male choice for each class. source: A: ir thailand official facebook GM reply "you can also find new information in reddit"
I’ve been on reddit... didn’t see anything new. Did I miss something? And do you have any links to the info you posted? or discord channel / general room scroll up a bit and find the English translation I shared with #Ari. There will be a little animal race but you cannot choose from gender in animal race. Really? Instead of adding more options to the character creator for a more varied personalisation, they just decided to make animal features exclusive to a single one-gender *small* race? What a grandious sh1t show. It would be quite interesting to see some more variety, but I understand it with having to tie into the lore! I find it unfortunate though if the races are gender locked. @Arika Unfortunately, I don't know any Thai and I have zero knowledge of that language - but I know Korean though. I can't understand the source so please help me out literally with the translations if you know Thai. By "Animal Race", did they meant exactly these? If so, then these are Housing NPCs, nothing more - they are not playable. From available Korean source, 2 of them are called "Residential Manager" (주거지 관리인) and "Raw Material Merchant" (생신 재료 상인) from Open World Housing in Harth Continent, and the other 2 of them are "Carebear Residential Manager" (Care Bear의 주거지 관리인) and "Collection Merchant" (채집물 상인) from Player/Personal Housing (which is Instanced for every Player) in Sunsetville in Nousgard Continent. Can somebody confirm that there are 'playable' Animal Race in the game? Because I have doubts in that. Maybe he did included non-playable Races in the discussion as existing Races in the game. Maybe the discussion is about existing Races in the game, not existing playable Races. The Main Character of the game that serves as conduit for players to experience the Story subjectively, is either a member of the Ontaris or the Vulpins. They are Human Kingdoms that perished after the destruction of the world. You as a player - from what I saw in the Korean version - is one of those Faction member who has been reborn and start early on the game from childhood as one of the "Children of Stars". Furthermore, the PVP Activities of the game (including the Open World PVP) revolves around Faction vs Faction (Ontari vs Vulpin). It's really the same as Bless - you can attack someone from an opposing Faction but not someone who is an associate of the same Faction. You start the game as a child (and not as an adult) as a "Child of Stars" who will turn to adulthood later on in the game. You have no memory here of your past because the Nous erased your memories as a condition of your rebirth (the people of Nous do not want the same Faction-conflict to occur once again between the Ontaris and the Vulpins whom were warring against each other in the past). The Ontaris and the Vulpins who have been reborn with their memories erased are called the "Children of Stars" (they were resurrected and came from the form of an orb raining down from the sky - hence, Children of "Stars"). I don't see how an "Animal" fits into this Story and PVP-gameplay as the Main Characters, as the Ontaris and Vulpins are Human kingdoms. They also called this PVP-MMO "Ascent: Infinite Realms" due to infinite (which literally means persistent and unending) war of realms. What is a "Realm" literally? I think this concept goes for most or every languages, as you know, I speak 7 of them. A "realm" is a kingdom, an empire, and a country. The concept of a kingdom historically came from the claim of an unoccupied area turning it to a territory under the sovereignty of it's own society governed by it's head of state. Without societies to divide a whole world, the world will still be whole, the concept of territories wouldn't even exist (who divided them?). Also, it means formation of many societies as particular communities (and communities occupy space, a particular area). That's why these words are synonymous in the dictionary. Realm = "왕국" which is Hanja-based. A Hanja originated from Chinese and I'm also fluent in that language. "왕" (王) means King or Emperor, "국" (Traditional: 國) means Country. Put those 2 Hanjas together to form a word and it means a Realm and Kingdom in every Korean dictionary, and "왕국" is the only word we have in this language to represent these concepts, there are other few certain words but they are very distant in meaning, if not, completely different (such as "세계", another Hanja-based, "sekai" in Japanese, which literally means the "world". A "realm" is a portion of a world, a world is a whole, the term "world" can even be used to represent the entire universe or the entire existing societies as one if you use that word in context). A Realm is a Kingdom, both in the context of territory and society or a representation of either, it doesn't matter what language and I can tell you this as a Polyglot! Without coming from a Faction, how can they possibly be a focal part of this game as already expressed by the Title? The game is about the Ontaris vs the Vulpins - the 2 historically opposing Kingdoms (societies) that are fighting over territories (in Realm vs Realm - which is what this game is about - both Factions get the chance to defend and assault an Instanced territory - they only serve as a battleground for the RvR activity really). The difference above are the prepositions - you can tell the meaning in the context based on the preposition used. It's an easy distinction that requires no technical understanding of English! If it's about the war of Kingdoms (societies), what is the Faction of these Animals that is nowhere to be seen? The whole Race is a union of it's own? I never heard this in the Lore before! So with all of these said, I have doubts regarding a playable Animal Race and they are absent in the Korean CBT. My source is the Korean version of this game in which I trust and understand. Check TH A:ir facebook GM comment in system req picture. she exactly say have an Animal race and animal race dont have gender. 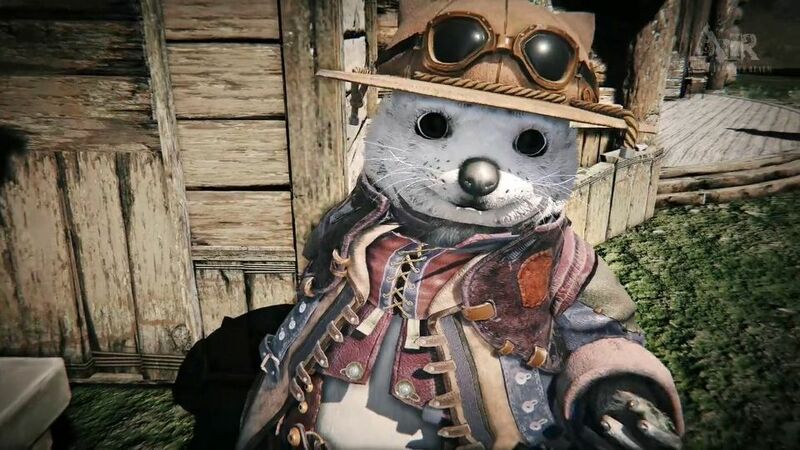 and can be seen in a video as these little creatures leap into the airship.. very old gameplay video maybe cbt ingame cinematic video in kr ..
unfortunately I can't find this video .... and i was looking for a lot before but dont find. and what you show is that old version of KR ... there was no animal race yet! TH is new version and first release A:Ir only thailand in pre-obt world wide. its new and optimalized version and yes have an animal race..
Nupy, CreativeX and Hospital like this. I don't see any significant issues with it tbh.